Is Christopher Senyonjo a gay martyr or gay icon? The Associated Press has a story out today on a former bishop of the Church of Uganda who has broken ranks over the issue of homosexuality. For those who follow Anglican affairs the story of Bishop Christopher Senyonjo (also spelled Ssenyonjo) will not be new. The bishop is a frequent visitor to the United States and has spoken many times in public forums about his views on homosexuality. The AP story entitled "Despite new law, Ugandan cleric ministers to gays" breaks no new ground, but offers an updated profile of the bishop in light of the country's new laws on homosexuality. Given the low state of knowledge about religion in Africa held by the general public and the controversy the Ugandan gay law has created I can understand the editorial thinking that went into commissioning and publishing this article. "African church leaders are anti-gay. Several African countries, including Uganda, have adopted laws toughening sanctions against homosexual activities. Here is a bishop who is bucking the trend," says editor A. "Go for it." The article does a nice job in quoting the bishop and gay activists in Uganda. It fits into the wider Western media narrative about homosexuality also. However, the article is not balanced in that it does not offer the voice or views of those who hold the contrary position. And it does not test the claims made by the bishop and his supporters. Yes, the article cites a past statement on homosexuality by the head of the Anglican Church in Uganda, Archbishop Stanley Ntagali, but we hear nothing from the church about this issue or about Bishop Senyonjo. Ssenyonjo was defrocked 2002 for his ministry to gay men. Gay specialty publications and a few mainstream news outlets have also repeated the claim that the bishop was defrocked over homosexualoity, but there are several dates floating about as to when this actually happened. The AP says 2006, RNS says 2002. As far as I can tell no one has ever looked at the documents or asked the Church of Uganda what it thinks happened. Yes, Bishop Senyonjo is a vocal supporter of the normalization of homosexuality. I do not doubt he has said what has been reported and there is no evidence that he does not hold the views he propounds. This post is not about the bishop or his views. It is about reporting, and the reporting from RNS and the AP has been pretty poor. The choice of topic and subject is not poor, I hasten to add. Rather an incurious Western media has not done the basic research expected in a news story -- or they have egged the pudding a bit, and "sexed up" the story to make it even better. 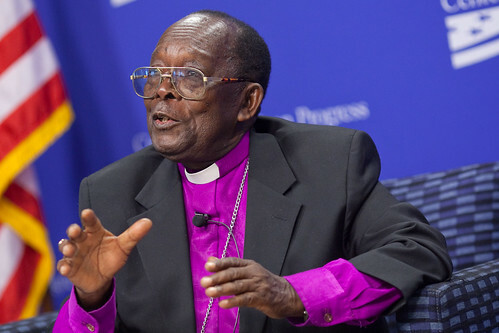 However, reports on the bishop’s background provided by his partisans have misstated his status, the Church of Uganda tells The Church of England Newspaper. Claims the bishop was deposed in 2007 for his support for the gay community or his association with gay pressure groups are false, the church notes. Bishop Ssenyonjo was deposed on Jan 17, 2007 by the Church of Uganda after he took part in the consecration as bishop of a former Anglican priest for the independent Charismatic Church of Uganda, the Ugandan provincial secretary told CEN. “One of the co-consecrators was another deposed Uganda Bishop, the former bishop of North Mbale. He had been deposed because he took a second wife. So, Ssenyonjo was not deposed because of his association” with gay advocacy groups, the spokesman said, but for having conferred episcopal orders upon a priest in a church not in communion with the Church of Uganda. It is true the bishop has sharply different views on the issue of homosexuality than his peers in the Church of Uganda. But the man portrayed in the West is not the man known in Uganda. My post does not attempt to resolve who the true Bishop Senyonjo is. A martyr to homophobic bigots or as his compatriots in Uganda believe, a retired bishop who once out of office found a group of wealthy Americans to bankroll him. There is little doubt the bishop has become an icon for some in the West. But it is far from clear that he is a martyr. The truth is out there but it is not likely to be found when stories not checked.